Take your driving lessons in Croydon with us today and receive a fully qualified grade A instructor, we don’t give trainee driving instructors to our pupils as they don’t have enough experience at your local test centre. Some driving schools won’t tell you if they are sending you a trainee instructor, so always check that they have a green adi badge, if they have a pink one, you should give us a call on: 0330 124 4877 and we will allocate you a local, qualified driving instructor that knows all of the test routes. Start your driving lessons with us today for as little as £20 an hour, Our best ever sale ends soon. Looking for a top a driving school in Croydon? We don’t blame you. Luckily you have found driveJohnson’s. We promise to help you pass as quickly and safely as possible. Our average learner took approximately 26 hours last year to pass their test – that’s less than half the national average. We won’t waste anytime, once you can drive we will have you driving in and around Croydon test centre so you grasp the popular roads such as; Canterbury road, Kingswell road, Meadow view, Queens road, Clifton road, Whitehorse lane – you get the idea, we know all of the test routes in your area! 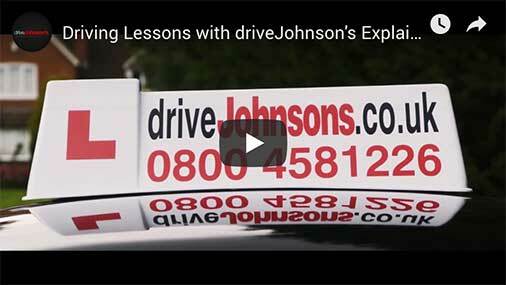 How much do driving lessons cost in Croydon? I want to thank Chris for being amazing and for every hour he spent teaching me a skill I know I will use for the rest of my life. I started my driving experience with him and this made passing my test just that much better, knowing that we had been on that journey together. He explained things clearly and helped build my confidence when driving and in life. During every lesson I would receive constructive feedback and in the lessons leading up to my test we would discuss what my weaker areas were and focus on tackling those within the lesson. He really makes the effort to build relationships with his students, and from day one you know he believes in you and your ability to succeed. I’ve now passed my test but I will miss our little chats. I’m proud to say I was his student.